Reprinted from The Houston Chronicle. Buffalo Bayou at sunrise as it flows past Memorial Park on the left and River Oaks Country Club on the right. Photo by Frank Salzhandler. The threat in Memorial Park is only the beginning. 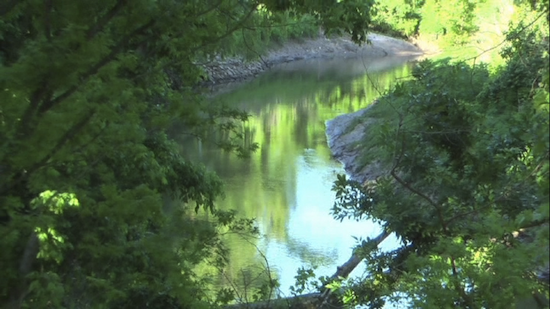 The Harris County Flood Control District calls the plan a “demonstration project” because the county intends to use this disputed, heavy-handed method on the natural landscape of Buffalo Bayou in neighborhoods upstream, areas saved from the same fate decades ago by dedicated Houstonians such as George H.W. Bush, Army and Sarah Emmott, Terry Hershey and George Mitchell. The flood control district’s “erosion control” project affects 6,600 feet and nearly 14 acres of bayou, as well as a significant portion of the Hogg Bird Sanctuary. The original but growing cost of $6 million is being funded by Houston and Harris County taxpayers and by the River Oaks Country Club, which has been convinced that the project will stop erosion of its golf course. Instead, the club will lose valuable forest and land. Riparian forests, along with native understory, are critical to storm water management – absorbing runoff. Among other problems, the project would ruin critical wetlands and send floodwaters downstream faster, making downtown Houston more susceptible to flooding. Dr. Mathias Kondolf, fluvial geomorphologist at the University of California, Berkeley, describes the plan as “pseudo-science.” Projects using the proposed methods have failed and washed out in other states, including Maryland, Washington and California. My native Houston, Texas just doesn’t get it. I just returned from Yellowstone National Park less than 24 hours ago. Beautiful, pristine, indescribable. The wildlife there was phenomenal. The area was covered in signs to stay on the paths, recycling bins were everywhere, even in the towns. The locals and visitors appreciated every living thing around them. And yet, I had to come back to a city that just won’t keep up with the green movement that the rest of the country has already been doing for years. It’s heartbreaking to say the least. I am a former Texas Parks & Wildlife employee with a wildlife science degree, a current wildlife rehabilitator, an avid birdwatcher, a native plant enthusiast, and a huge conservationist. We have such a treasure right here in the 4th largest city, yet projects like this keep popping up without the right foresight in planning to keep our wonderful city landscape as intact as possible. Have we not heard of ecotourism? Houston and the Texas Gulf Coast has the largest migration of birds of any other major city in the United States. Just ask the Audubon Society. If this project is halted for at least 60 days, we have the most amazing, knowledgeable and experienced resources to consult with right here in our own city and state to seek out the best possible ways to use to avoid disturbing this irreplaceable, amazing riparian environment that currently exists right in the middle of Houston. The Native Plant Society of Texas, Texas Parks & Wildlife Biologists (Freshwater & Wildlife Biologist to be exact), the Buffalo Bayou Preservation Society, the Audubon Society and many other awesome agencies and organizations that can offer advice on how to approach this project to keep it as pristine and sustainable as possible. I get it, we are a big city and progress is unavoidable. But do it the intelligent way. I realize there will probably be some egos to deal with, setbacks, controversies, etc. But once we destroy a natural environment like this, it’s gone. ‘Replanting’ for aesthetics to please the average city dweller is sad…they are inner city citizens that move in closer to live and work, okay, understandable. But WE citizen scientists and environmental professionals can go one step further and say, ‘hey, let’s do it this way!’ and teach people why we just left things alone. Keeping the native grasses and plants not only feeds the wildlife, it keeps the city from having to fertilize (which pollutes our waters, destroys fish habitats), mow constantly, and allows an area where the city could establish birding tours to bring income into the city. Imagine that…making money off of things that already exists inside our city. Brilliant! We already have a bat population right under Waugh Street bridge. Word is spreading. Go to Austin and see the amount of people that watch the bats under Congress Street Bridge. Do you know how many restaurants and bars profit off the crowds that show up? Go ask them! Is our current mayor, Annise Parker, just trying to push this project through to boost her political career for AFTER she leaves this city? Doesn’t she call herself ‘progressive?’ Seems to me that her agenda to beautify the city in tearing down old buildings and promoting our recycling is only part of it, but not geared towards the native habitat. Does she not understand that’s even bigger??? I’ve seen her on television bragging about this bayou project for inner city dwellers but never ONCE did she say that this project was maintaining as natural an environment for plants and wildlife. That just wouldn’t be kosher, would it? Maybe she’s just ill informed. Please reconsider the future development of this irreplaceable treasure we have called Buffalo Bayou for decades. Contact the Hogg Family Att. I don’t think the city and engineers can do this…..
Indian Jones was asking what they were going to do with the Ark, they said they had top men working on it! Top Men. This is the same level of science offered HCFC and just to be fair the idea that this project reduces sediment down stream…is a learned script.